I've been very busy this week, so I have not had much time to write much of anything on here. But the last recipe in my foray into Eastern Woodland Native American food doesn't take much time to make anyway, so it shouldn't take much time to write about either. This recipe is frybread. Unlike the other things I made, frybread is not in any way native to the Eastern Woodlands. It is, in fact, from the Great Plains. However, the popularity of frybread spread throughout the United States and Canada, perhaps by way of the powwow circuit. It's very much a part of the powwow, and that includes the powwows you find in Maryland, including the big one held every year at Patterson Park the Maryland State Fairgrounds. There are many recipes for frybread. Many of them give you a fried dough that, when finished, looks very much like an elephant ear. You can leaven it with either yeast or baking powder, either pan fry it or deep fry it, and make it either sweet (with honey, maple syrup and sugar) or savory (with salsas, cheese and ground beef, to make the famous Navajo taco). I stuck with Dale Carson's recipe, also in her New Native American Cooking book. The recipe was a simple standard one. Carson's version is pan-fried, but you can easily do this in the deep fryer instead. You probably have all the ingredients laying around - flour, salt, sugar, baking powder, vegetable oil and warm milk. You also need an extra bit of oil for the pan. They look like pancakes, but they're not. 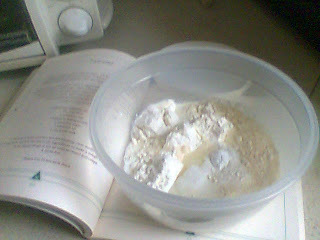 Mix everything together and form the dough into small disks, about 5" (in retrospect, I think mine were a little small). Fry them until golden brown on each, and watch them so you don't burn them. Oops. I admit that I expected my frybread to look like the fried dough I'd gotten at the State Fair or the Baltimore Powwow. 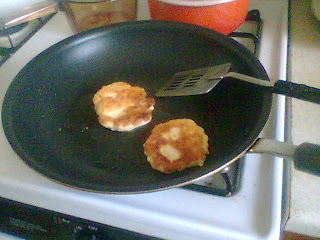 Instead, they looked and felt like dense little hoecakes, but made out of wheat flour instead of cornmeal. 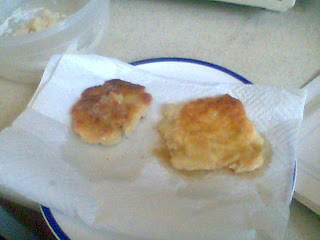 They're still good, but next time I want to find a recipe that'll give me something fluffier instead. I decided to do one savory and one sweet. I doused the sweet frybread with a bit of maple syrup (again, trying to get as much use out of it as possible). The savory one at first just got covered in butter, but then the Chesapeake started screaming to me, and I found my hand being drawn uncontrollably to the Old Bay. If anyone eats any kind of savory fried dough, you really should put some Old Bay on it sometime. Again, just about everything goes well with Old Bay. I like fluffy frybread better than the denser kind. As we get closer to the cold and bleakness of early winter, something hearty is in order. My next food ethnography project should help me in that regard. That's a big friggin' clue, huh? Hi. I'm a Dine woman from AZ and I got a good laugh when I saw your frybread. As a Navajo woman I made hundreds of frybreads. If you need some help, hit me up.